Live from Peoria, Illinois, it’s Saturday Night starring this week’s host, Paparzazzi, with special guest star Bruce Brown and featuring the Ready For Prime Beef Player, Marty Wombacher. And now, please welcome, from Peoria Heights, this week’s host, Paparazzi! Here we are at Paparazzi, which has been standing tall here on Voss Avenue just off from Prospect in the Heights for over 30 years. It opened up in 1983 and was here decades before the “restaurant row” was born in the Heights. I dined here often in the 80’s and early ‘90’s before I moved to New York and I kind of forgot about the place and probably haven’t been here since 1993! Paparazzi isn’t on the main drag in the Heights, so you don’t drive by it and it was lost in my pitiful memory until I read this glowing four star review by Phil Luciano in the PJ Star. I immediately made a mental note to come here for dinner, and since I’m feeling a little mental tonight, here we are! Let’s go inside and see if this place has changed since I was last here over 20 years ago! Wow, it looks exactly the same in here! I kind of feel like I’ve walked back in time to the ‘90s! I met Lisa Mancuso, who owns Paparazzi with her husband Bruce Brown. I told her it had been decades since I’ve been here and she welcomed me back and took me to a table in the dining room. Lacey was my waitress and here she is with a bottle of Peroni. She took a picture of me at my table. I wanted to document this because this is the first time I’m sitting at a table by myself in a restaurant for the blog. Usually when I go out alone I sit at the bar, but there’s no bar at Paparazzi, so here I am at my table for one! Here’s the view of the side wall which is loaded with pictures and photos and lights are strung up just below the ceiling. The decor and vibe in here is simple and casually elegant. There’s really a timeless feel in here. The atmosphere is familiar without having an old fashioned feel to it. 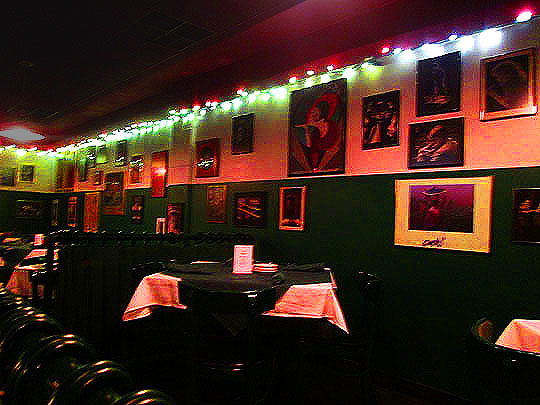 This restaurant reminds of the family-owned restaurants in Little Italy in New York City. Meanwhile back at my table, I think it’s about time for the weekly Saturday night dinner to happen! Looks like I was right. There’s a loaf of fresh bread, they have garlic bread here too, but sadly garlic gives me heartburn, so I went with the plain bread which was homemade and delicious. 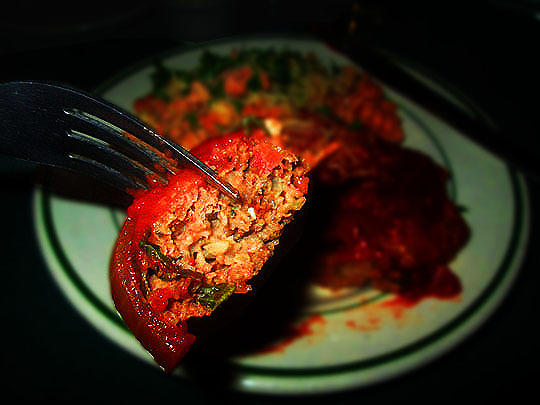 I started off with an appetizer of red, yellow and green bell peppers which were sauteed in a marinara sauce. This was unbelievably delicious! I’ve never had bell peppers prepared so delectable and this reminds me of my fantastic dining experiences here in the past! This is really a special appetizer and you know why? Because it says so right here! So there! As I was finishing off my appetizer, Bruce Brown, the co-owner along with his wife, Lisa came over to my table to say hi. Bruce has been a colorful figure in the Peoria community for years. 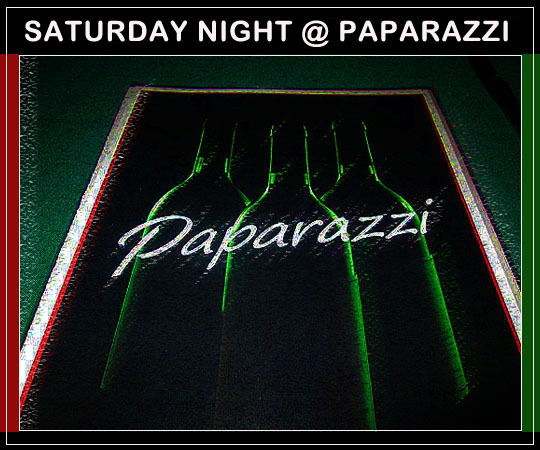 Before he opened Paparazzi he was the youngest Peoria City Councilman in this city. When he and Lisa opened Paparazzi, neither had any experience in owning and operating a restaurant. He had help from his brother Don, who was a chef in Pebble Beach and they sculpted the menu from family recipes, many of which were invented by their mother. After the first chef they hired went off to another job, Bruce took over the cooking duties and he creates every dish that’s ordered in here, which is amazing! He credits his brother Don for giving him his vision on his culinary skills. He told me that everything has to be timed perfectly and to prove that as he was talking to me he had a timer in his hand and frequently got up and ran back to the kitchen to keep the rhythm of the meals correct. Bruce has some great stories to tell and one of them is about his daughter Aryn Kyle, who’s a best selling author. You can read all about her right here, now it’s time to taste the main course that Bruce cooked up for us tonight! Wow, this looks amazing! I got the Beef and Sausage Polpettone, which is an Italian meatloaf. It comes with a side of the nightly pasta which is a homemade rotini pasta in a creamy and tasty pink sauce. The pasta was heavenly, now let’s try the meatloaf! This was beyond wonderful! The beef was savory and mixed well with the seasoned Italian sausage. It was topped with marinara sauce and mozzarella cheese and it was so tasty. Bruce told me that his brother Don had taught him to cook with a feel for how the ingredients have a relationship with each other and that definitely rings true with this delicious dish! Bruce is a photographer and he developed his photo skills while doing duty in the U.S. Marine Corps during the Vietnam War. He was a photographer in the Corps and his photos appeared in Stars and Stripes. This is one of his photos taken in Okinawa where he was stationed. Other photos on the wall are original prints from his friend, former teacher and former PJ Star photographer, Al Harkrader. The top is Marilyn Monroe and below that is Dwight Eisenhower. Here’s Bruce pointing to one of his favorite Al Harkrader photos in the restaurant. It’s famed comic actor, George Burns lighting a cigar before a speaking engagement at Knox College. This is an amazing portrait and now it’s time to say, “Say goodnight Gracie.” Goodnight Gracie and thanks to Bruce and everyone at Paparazzi for a wonderful meal and evening at one of Peoria’s somewhat hidden gems! We’ll see you all tomorrow! I started off the meal with a special appetizer for the evening. It was red, yellow and green bell peppers sauteed in a marinara sauce and this was so tasty. The peppers were cooked perfectly and maintained a crunch while still being tender. The marinara sauce complimented them perfectly and this was a wonderful start to a fantastic dinner. For the main course I got the Beef and Sausage Polpettone which is an Italian version of meatloaf. It was so tasty and the beef and Italian sausage had Italian spices topped off with a marinara sauce. This melted in my mouth in a most delicious manner and was like no meatloaf I had ever tasted in my life. The dish came with a side of rotini pasta in a pink sauce that was rich and satisfying. My memory banks were recharged on what fine dining is served here! Four Galloping Gourmets—If you’ve never been to Paparazzi, I recommend you go soon and try some of Peoria’s best Italian food. It’s all made from scratch and it’s delicious and unique. 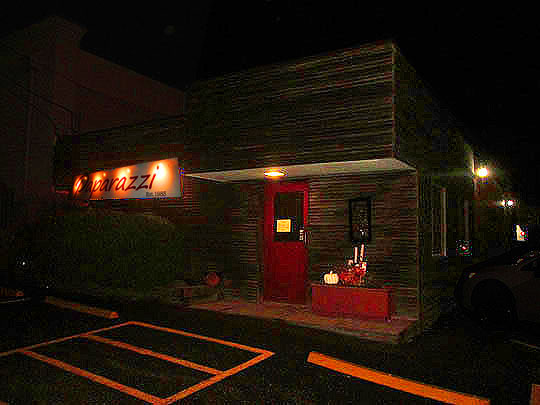 I’m sorry I had forgotten about Paparazzi, but now that my memory and taste buds have been reminded of this classy restaurant, I’m going to try to make up for it now, so don’t be surprised if many return visits show up here on MBIP! Related Posts: Saturday Night @ The Fish House, Castle’s Patio Inn and The Burger Barge Boardwalk.